BRUSSELS – Tens-of-thousands of photographs taken by participants in the World Jewish Congress’ #WeRemember campaign to raise awareness about the horrors of the Holocaust and antisemitism will be screened January 24-25 at the North Atlantic Treaty Organization’s (NATO) headquarters in Brussels, via satellite of a live stream taking place for a full four days on the grounds of Auschwitz Birkenau (January 23-27). The photos will be projected simultaneously via Facebook LIVE, YouTube, and Twitter to a global audience. WJC Deputy CEO for the Diplomacy Maram Stern and Italian Ambassador to NATO Claudio Bisogniero were among the speakers at the NATO ceremony, which coincided with multiple awareness events taking place around the world to support the #WeRemember movement, including the hosting of a Holocaust survivor’s testimony at the Twitter headquarters in New York. 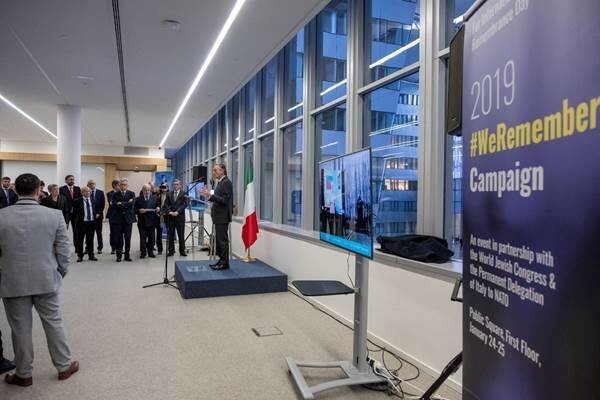 “This year we chose to partner with the WJC #WeRemember campaign as a way of using new technology and social media to reach the widest possible audience,” said Bisogniero. “Education is key to raising awareness about antisemitism, and so too are the critical international partnerships that we are building to secure commitment to this effort. It is all the more significant that we have brought this initiative to the headquarters of NATO, the very organization that was created to unify nations in the wake of the horrors of the Holocaust and World War II,” said WJC CEO and Executive Vice President Robert Singer. Be the first to comment on "Tens of thousands of #WeRemember photos screened at NATO raise awareness about Holocaust"